Does canned hunting save wild lion populations? The simple answer is no, it in fact accelerates their decline in the wild. The 200 or so lion breeding farms in South Africa need a steady supply of new cubs smuggled from the wild to supplement the breeding stock and to prevent the inbreeding that occurs when close relatives are mated. 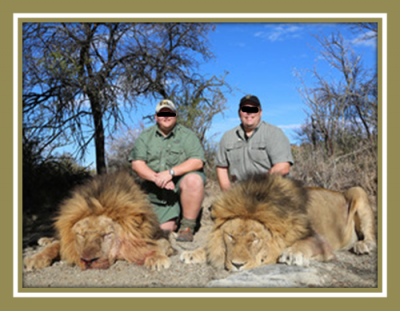 Canned lion hunting is the “bargain basement” option for new recruits to the sordid world of hunting. The experience often stimulates demand for the more expensive but more socially acceptable (apparently) wild lion hunting. One of the spin off industries from canned hunting is the very lucrative and rapidly growing lion bone trade. Once the bargain basement hunter has taken home his skin and maybe the head, the lion carcass is left for the hunting outfitter to sell on to Laos and Vietnam to satisfy the inexhaustable demand for lion bones for the Traditional Chinese Medicine (TCM) trade. It doesn't take long to realise that poaching lions in the wild for their bones and teeth is a much cheaper option than paying the rising price demanded by the canned hunting operators. Wild lion bones are considered to be more “potent” than canned lion bones and so fetch a premium price in the TCM trade. Both canned lion hunting and wild lion hunting decimate our remaining fragile, rapidly dwindling wild lion populations. There are barely 15,000 lions left now in the wild and only 5 viable populations across Africa. Zambia has now announced that it will reopen its lion hunting in 2016. We estimate that there are no more than 40 adult male lions (trophy lions) left now in Zambia and if the hunting does indeed reopen, Zambia will shortly be added to the growing list of African countries where lions have become extinct. Canned hunting is also a huge animal welfare and animal cruelty issue, subjecting the 8,000 or so canned lions in South Africa to a short but excessively cruel life to satisfy the growing demands of the multi million dollar canned hunting industry. Please support us as we fight to close down both wild and canned lion hunting. The villagers do NOT receive the benefit of hunting dollars when tourist hunters shoot lions. The monies paid go directly to the hunting operators and to Government coffers. For example, rural communities only receive $4 per square kilometre of land per year that they set aside for hunting concessions, in Tanzania. For communities, this is the least profitable use of their land. This is why poaching in hunting concessions is out of control.